Mistakes come in different shapes and sizes. 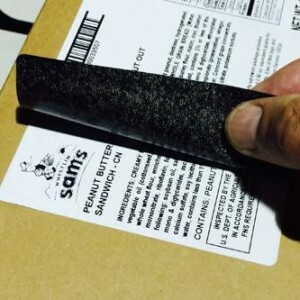 Using a pressure sensitive sticker with a black or grey opaque sticky backing will ensure the old label will not show through the existing label. 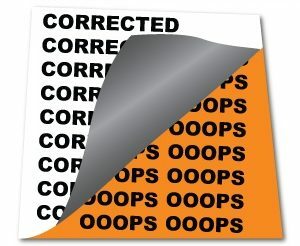 Our Cover-Up Labels can fix your problem without the cost of re-printing. The goal of the label is to block out the type and/or graphics that has changed or is incorrect. The adhesive is permanent and will not peel off so you can’t see the mistake printed underneath. Need to change the ingredients or UPC barcode? This is a common occurrence for our customers. We can print on a variety of stocks based on the area being covered up. Our high gloss stock with a opaque barrier is the answer for covering up another label, changing an address on a brochure or block any area to solve the problems. Try our brown kraft stock that matches most corrugated cartons. Use an opaque film with a dark backing if you need a label that is extra durable for outdoors. Whatever your mistake, relabeling the area will save considerable dollars rather than re-printing or re-packaging. Call Blue Line Labels at 1-800-609-7079 in in Florida to discuss your label needs.